City, Town, and Village–What’s the Difference? A village is a small community in a rural area. A town is a populated area with fixed boundaries and a local government. A city is a large or important town. The word village comes from a French term referring to a group of buildings. That’s exactly what a village is—a small community in a rural area. Sometimes, larger towns incorporate the houses of a village as a municipality. Village can also refer to inhabitants of a village and is even applied to groups of animal dwellings. The books transported her into new worlds and introduced her to amazing people who lived exciting lives. . . She travelled all over the world while sitting in her little room in an English village. Town comes from an Old English word that referred to a walled or fenced place, such as a farm, village, or courtyard. Our modern word refers to populated areas with fixed boundaries and a local government. Towns are usually bigger than villages, but smaller than cities. The term can also refer to its inhabitants, its townspeople. Home wasn’t a set house, or a single town on a map. It was wherever the people who loved you were, whenever you were together. 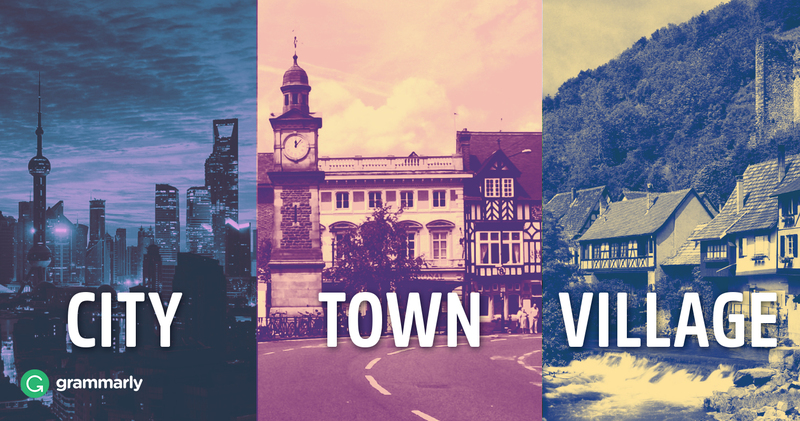 There are many expressions that use the term town in English. To go to town means to do an activity wholeheartedly, successfully, or freely. A man or woman about town is someone who attends public and private events often. A night on the town is a night of entertainment outside your home. To paint the town red is to party. Can you think of others? City derives from a French word meaning citizenry. A city is a large or important town. In the United States, cities are incorporated municipalities with local governments. In Great Britain, a borough with a bishop’s seat is called a city. As with the words village and town, city can also refer to the its inhabitants. It’s like watching Paris from an express caboose heading in the opposite direction—every second the city gets smaller and smaller, only you feel it’s really you getting smaller and smaller and lonelier and lonelier, rushing away from all those lights and excitement at about a million miles an hour. Many interesting uses of the word city exist in English. For example, imagine you see a place with a lot of stray dogs. You might call it “dog city” to indicate that it is full of or indicative of dogs. A city slicker is someone who doesn’t know much about country life. If you say that you can’t fight city hall, you are saying there’s no way you will win in a battle against bureaucracy. A village is a small community. A town is usually an incorporated community that is larger than a village. Finally, a city is a large or important town. Where do you live?